PC World has reviewed a All-in-One printer from Lexmark. The printer is called Lexmark Pinnacle Pro901 and is able to print, scan, copy and fax at a pretty low price. PC World ends up giving the Lexmark Pinnacle Pro901 an ok review with an overall score of 3.5 stars out of 5 possible stars. The reviewer likes several points with this Lexmark printer including the 5 year warranty, inexpensive high-yield black ink and many good features including the large touchscreen. On the negative side we find a poor input tray and the color inks are quite more expensive than the monochrome. Overall the Pro901 AIO printer is a good for small offices, but there are many other good printers in the same price class. Read the full review of the Lexmark Pinnacle Pro901 All-in-One printer here. PC World has tested the Lexmark Interact S605 Wireless Multifunction Inkjet Printer. 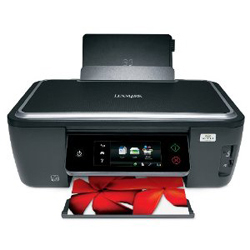 This Lexmark has a large 4.3″ LCD with touchscreen abilities and can print, scan and copy. PC World gives the Lexmark Interact S605 a mediocre rating with an overall score of 3 points out of 5 possible. On the positive side the reviewer finds the Lexmark printer to have some nice touchscreen controls and the automatic duplexing function is useful. On the negative side we find that the printer makes some washed out copies and the ink is pretty expensive. Overall the S605 has some nice specifications, but the expensive ink is a real turn off. 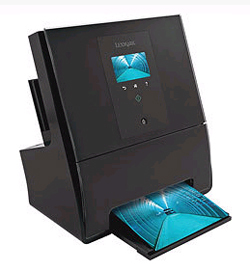 Read the full review of the Lexmark Interact S605 Wireless Multifunction Inkjet Printer here. 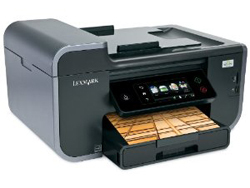 Printer Comparison has reviewed a multifunction laser printer (MFP) from Lexmark. 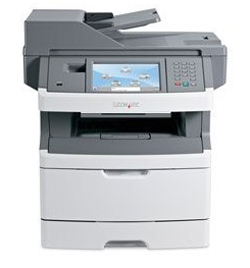 The printer is called Lexmark X466de and is able to make monochrome prints, fax, scan and copy. Printer Comparison ends up giving the Lexmark X466de an overall score of 4 out of 5 stars. The X466de scores highest on features, print quality and print speeds while scoring a bit lower on operational costs, ease of use and service and support. The reviewer find the printer to be very good and has many good features including the large 7″ touchscreen control panel.. If you need a monochrome multifunction printer that is fast this Lexmark might be your choice. Read the full review of the Lexmark X466de multifunction laser printer here.